Toughness, grit, physicality, “he’s hard to play against”; these are the types of things heard about newest Sharks defenseman Roman Polak. While being tough and physical are beneficial qualities to have in any hockey player, when they are the primary positives placed upon players, it’s often a red flag. In Polak’s case, the red flag is very much warranted. Anyone who suggests Polak makes the Sharks a better team is simply living in the stone age. This isn’t the 1970s anymore, all 18 skaters in the lineup need to be able to skate and move the puck. In a league where many teams are learning to utilize possession analytics, the Sharks seem to be a team still hanging on to hockey’s history of toughness. Polak may be able to “clear the crease” effectively from time to time, but the idea is to limit the occurrences where the defenders have to do just that. Currently the Sharks third pair has to do a lot of crease clearing because they rarely have the puck. While the Sharks have been playing quality hockey here in the second half, their third pair with Polak on it has been significantly worse than it was before. The constant on that pair, Brenden Dillon, had been putting up solid possession numbers since the Sharks hot second half started in early January. From Jan. 9 through Feb. 9, Dillon played in all 14 Sharks games and posted a 53.8% Fenwick percentage. These 14 games were all played with rookie defense partner Dylan Demelo. Albeit the third pair sees the easiest matchups, but the Sharks were actually a slightly better possession team with Dillon and Demelo on the ice than they were with them off. Over those 14 games the Sharks rolled off a 10-2-2 record. Since coming back from injury, Dillon has played his past 10 games with the newly acquired Polak. Over this span, Dillon’s Fenwick percentage has dropped 8.6%, all the way down to 45.2%. Dillon and Polak’s Fenwick percentage relative to the rest of the team is an incredibly porous -9.3%. This isn’t just a minor drop off, it is a monumental decrease in effectiveness. It isn’t surprising either. Ask anyone around the Sharks and they will tell you that Demelo was getting better and better each game and was really complementing Dillon well on the ice. Demelo is an offensive minded player who can skate and pass his way out of trouble and was rarely making any defensive mistakes. Sending him down to the AHL in favor of Polak has been a major backfire. The team record has still been decent at 6-3-1, but not as good as that 10-2-2 mark and their overall game has dipped. Polak is simply far too similar to Dillon. Both are stay at home type players and they really struggle to break out of the defensive zone. Analytics aren’t even needed to prove that point, just watching the games is enough. Dillon and Polak have to make five or six passes back and forth before they get the puck to the forwards. Neither one is comfortable being the puck mover that initiates the breakout. If you’re a fan of plus/minus, Dillon was plus-4 during the previously mentioned 14 game stretch. With Polak he is minus-2. Certainly the Sharks could do worse than Polak for a sixth defenseman and they have done worse in recent seasons. However, trading away a second round pick for a veteran who clearly makes the team worse than the rookie he replaced, is a horrendous waste of a draft choice. 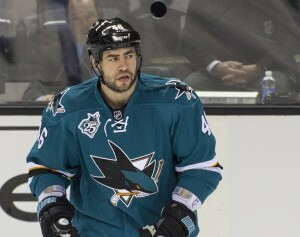 Apparently, there are some who think Polak has done a good job for the Sharks. Unfortunately for Sharks fans, that seems to include head coach Peter DeBoer. The numbers don’t lie though, Polak has been a ginormous drag on that third pair. He’s simply a right-handed version of what Douglas Murray was at the end of his career.